As part of a recent business development workshop, we invited a friend (we will call him Bob) who is the “partnership partner” for a well-known venture capital fund to serve as the “prospect” for our case study. The context for the case study was intentionally sketchy because our prospect was neither responsible for—nor likely much of an influence on—hiring legal counsel. We were interested to see how the lawyers would manage a meeting that did not have an immediate, direct new business opportunity. At an earlier session in the workshop, we explored with the participants the basic steps of an effective business opportunity meeting. The first step, we suggested, is to “have a purpose” for the meeting. Simple enough. We incorporated listening techniques into the session to remind the lawyers that new opportunities often come more from listening/learning than from a sales pitch. The teams struggled to find a “purpose” as they prepared for their meeting with Bob. Some ignored our advice and turned to the firm’s capabilities from the beginning. Others attempted small talk, but only until they saw an opening to share their own experiences. One team, however, gave themselves permission to “follow the trail” and was able to develop a strong sense of rapport with Bob. It was great to watch. As with most exercises, the “fun” is in the game but the learning is in the debrief. Every team learned that Bob is almost always willing to “take a meeting” with individuals he doesn’t know provided the recommendation comes from others in his network. Bob’s philosophy is simple: Take the meeting because we never know where the connection may lead. Bob encouraged us to enjoy the time, learn about others, tell stories, stay in touch and be open to opportunities to make and accept new connections. We know that relationships (and ultimately the opportunities for legal work) usually require multiple “touches.” Building rapport and trust takes time and patience. Add to your list of New Year’s resolutions a commitment to “take the meetings” when asked. Worry less about the immediate and think longer term. Enjoy each meeting, listen more and “follow the trail.” Not only will you make a good impression, but the potential for a new referral is enhanced. Stay (or get) organized. 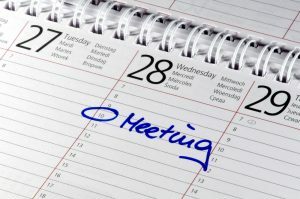 Set aside specific times/days for building your network through meetings.